Brilliant. 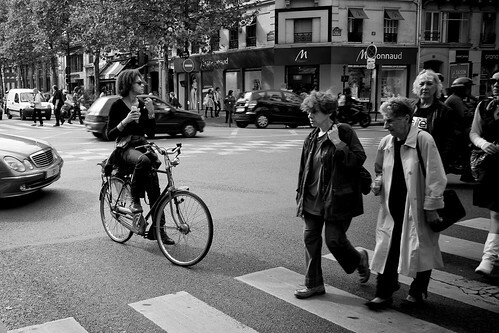 Sums up cycling in Paris. Waiting patiently for pedestrians to cross while snacking on a sandwich. Spent a few hours Velibbing around the city today. What a treat. Bicycle lanes all over the place and bicycles using them. Amazing to see. All just regular citizens in regular clothes. Both on the Velib bikes from the bike share system, but on their own bikes as well. A bike and a sandwich together in Paris. Perfection! But, where's the wine? Je suis jalouse!!!!! Bonne route, mon ami! Wonderfull classic bicycle too. A neww breed of bicycle shops has sprouted in Paris were you can acquire genuine vintage dutch bicycles straight from Amsterdam!